Introduction to my Lemon Chiffon WoodWick from Virginia Candle Co.
I’m pretty slow… I only recently found out “Old Virginia Candle Co” is now Virginia Candle Co. I don’t know why they changed their name since Old Virginia was such a well known name. Have you heard of WoodWick candles? I am definitely a WoodWick fan! These candles are extremely popular and once you try one, I think you’ll see why. Woodwicks are being talked about everywhere and if you’re a candle connoisseur, you’ll eventually want to try one. This is my second experience with a WoodWick candle and I loved it. They are so worth the price and last a very long time. Everything about these candles are cool… their vivid colors, the shape of the jar, the wood lids, and most especially, the wick and sound. SO COOL!!!!! The sound is really hard to describe… it doesn’t really sound like a crackling fire to me but more like a windy blowtorch kind of sound. It’s different and unique. My husband (who secretly thinks I’m insane) for continuing to buy candles (when I already have enough to open a store) doesn’t even bat an eyelash when he knows I bought one of these puppies and you know why? Because he likes them just as much as I do. He loves the sound… the scent wafting from the candle is secondary and just an added bonus as far as he’s concerned. Virginia Candle does put out some great candles and they are a very popular brand. They have a direct website, sell on QVC and many retail stores across the country also carry this brand. I know this company gets mixed reviews but I think for the most part, these candles are consistent and they have some great scents. They have a scent of the month going which usually compliments the seasonal month so that’s a great way to sample their products. What does my WookWick Candle Look Like? My candle is 22oz and has a sort of hourglass shape to it. It comes with a wood lid and has a removable sticker on the face of the candle that says “WoodWick”. The wax color was yellow. See side picture for visual reference. How did my Old WookWick Candle from Virginia Candle Co Smell? That’s a very simple yet catchy description and worked for me. Lemon, graham cracker, vanilla, cream… HELLO!!! Sweet lemons are my “thing” right now and Virginia Candles version totally satisfied that craving, no lemon cleaner here! It was simply a sweet and wonderful creamy lemon scent. 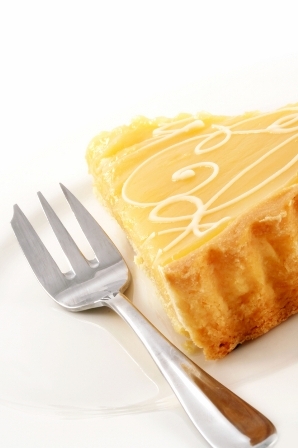 I didn’t really catch any zest, I could only smell the creamy vanilla part mixed with the lemon and I really liked it. The whole blend was quite delicious. The strength of this scent wasn’t as strong as I would have liked. With lemon scents, I like knock your socks off strong and to me, this scent was medium to light. I burned it in my bedroom which is a large room and could smell the scent when I walked into the room but it wasn’t strong. The scent stayed in that one room and never drifted into adjoining rooms. I still liked this scent enough to purchase it again though. I’ll just burn it in a smaller room. It was a great lemon and worthy of purchase. How did My WookWick Candle from Virginia Candle co burn? My candle burned great! It burned evenly with no waste on the glass. One aspect I’m finding I love with WoodWicks is I’ve never had to trim them. No wick dipping, perfect flames, no soot… perfect burns. This was a great experience yet again and will continue to purchase these candles. I’m usually a flighty person when it comes to burning candles (I get tired of the same scent every day) so I tend to change/rotate them out daily for something different. But, I found I burned this candle from beginning to end and never tired of it. That says something. I definitely recommend you try a WoodWick candle but keep in mind that sound effects come with the package. As long as you’re okay with that… I think you’ll be pleasantly surprised. 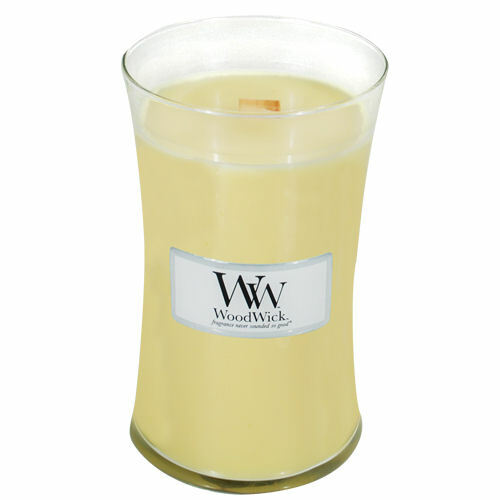 Have you tried Lemon Chiffon, a WoodWick candle from Virginia Candle Brands? Review it with us. It’s easy… simply write your review and star rate your experience in the comment section below. Scent description: Zesty lemon layered with a rich graham cracker crust and vanilla cream topping. I remember this fragrance from years ago. A nice lemon scent. Wish they still carried it.